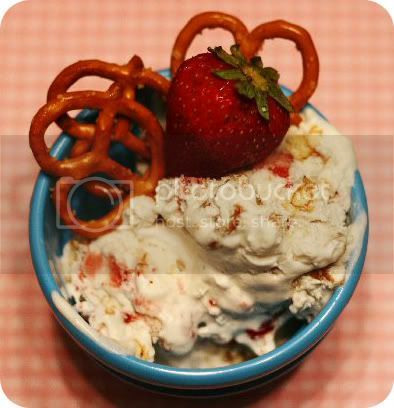 We made Heather Bailey's Home-made Strawberry Pretzel Icecream last night. Oh My Goodness!! It's the Best icecream ever! Recipe here. You know, it's Summer. And I'm sure everyone understands how crazy busy and fun summer can be. If there was some way to download my thoughts straight to the computer, then I would post so often that you'd probably be tired of me. I'm always thinking of great things to post but then I have those thoughts in the middle of doing dishes, folding laundry, grocery shopping, etc. and crashing into bed tired and happy from the fun of a busy, Summer day. What, no homemade ice cream for us?!?!?! Sheesh! Now I know where I stand. You have been up to so many awesome summer time activities. They sound like so much fun. We're in the middle of our winter here, which really is pretty mild, but reading about all of your summer time fun makes me look forward to summer. That home made ice cream looks so yummy. I have never made ice cream, but am keen to try it out this summer. Enjoy your summer living my friend. PS Thank you so much for your well wishes and comments to let me know that you are thinking of us. I really appreciate your sentiments and they put a smile on my face. Thank you my friend. Thanks for the recipe - it looks very good, I'm going to have to try it! Sounds like you are having too much fun! Yummmmmm. Hugs, enjoy while you can.